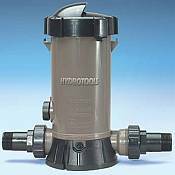 An automatic chlorinator allows you to properly keep your swimming pool chlorinated with the twist of a knob. Properly chlorinating your backyard swimming pool requires consistency, precision, and time -- many steps are involved in the process of chlorinating your pool, and this process must be completed several times each week during the height of swimming pool season. You can make the task of proper pool chlorination easier, though, with the help of an Automatic Chlorinator, also known as an Automatic Chlorine Feeder. Automatic chlorinators save you time because they slowly and automatically supply your pool water with a controlled amount of chlorine. Efficient and maintenance free, our durable, corrosion-proof automatic chlorinators and brominators are ideal for new or existing pools or spas and work automatically with your pump and filter system. 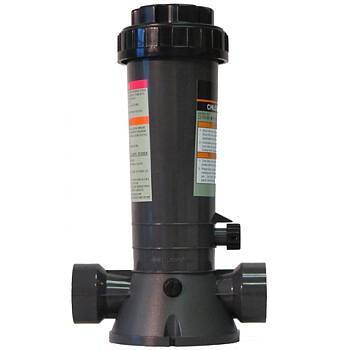 Each Chlorine Feeder that we offer uses large or small slow-dissolve tablets or sticks and provides a handy dial control valve that lets you control and adjust the rate of feed. 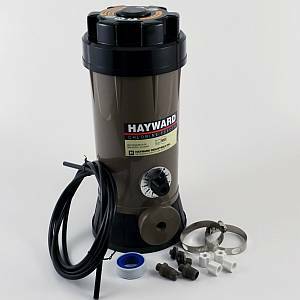 In addition, each automatic chlorinator is simple to install. WARNING: When refilling a floating or automatic chlorinator / brominator, always use the exact same type of tablets. If trichlor tablets were used, refill with trichlor tablets only. Never mix chlorine tablets with bromine tablets. What is Bromine? Briefly, bromine can be used as an alternative to traditional chlorine (sodium-trichlor) when sanitizing swimming pools. Bromine is less irritating to the skin and eyes, but it is not appropriate for those who may be allergic to chlorine since bromine tablets usually also contain some chlorine. Bromine is most commonly used to sanitize spas and hot tubs because it is more stable than chlorine in the warmer spa water temperatures; although, if you prefer to use chlorine to sanitize your spa or hot tub, it is recommended to use sodium-dichlor as opposed to sodium-trichlor because in higher temperatures, trichlor can irritate the skin.